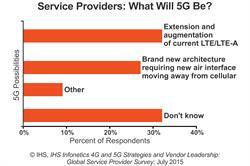 CAMPBELL, CA--(Marketwired - July 23, 2015) - IHS (NYSE: IHS) today released excerpts from its 2015 IHS Infonetics 4G and 5G Strategies and Vendor Leadership: Global Service Provider Survey, for which operators were interviewed about their LTE network deployment plans, challenges and service offerings. 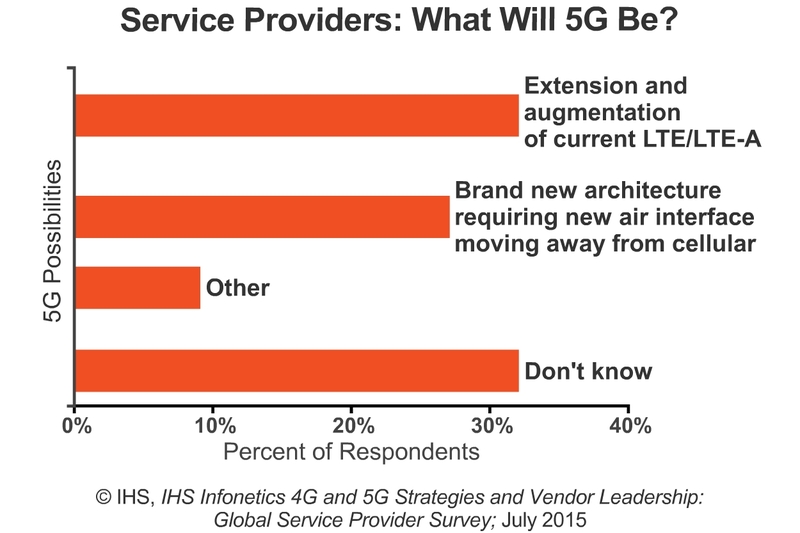 Half of respondents participating in the study say they have already deployed LTE-Advanced (LTE-A) in their LTE networks. "We are slowly but surely moving to true 4G, and that's good news. However, most users already believe they are on 4G, and that's the bad news because the experience is far from consistent and is falling short of expectations. How many times does your smartphone display LTE or 4G and you still see the infamous spinning wheel?" said Stéphane Téral, research director for mobile infrastructure and carrier economics at IHS. "The 5G debate has started with great fanfare, hype and confusion, but little substance about what it is exactly and what it is not. For now, the mindset is still locked into mobile broadband as we know it with LTE, so it's good that the ITU has just stepped in to define 5G in its brand new IMT-2020," Téral said. Inter-band carrier aggregation is the most common and very first LTE-Advanced feature deployed by respondent operators. Commercial voice over LTE (VoLTE) service is taking off slowly and ramping this year and next. 4G network functions virtualization (NFV) migration won't happen any time soon because the bulk of LTE networks are brand new and, therefore, mobile operators are not ready to undertake migration that soon. Ericsson, Huawei and Nokia (in alphabetical order) are perceived by survey respondents as the top LTE equipment manufacturers. For the 38-page 2015 4G and 5G Strategies and Vendor Leadership: Global Service Provider Survey, IHS interviewed purchase-decision makers at 22 mobile, incumbent, competitive and cable operators from EMEA, Asia, North America and Latin America. The study covers LTE network build-out plans; challenges and drivers; migration scenarios; LTE features, services and suppliers; and operator ratings of LTE manufacturers (Alcatel-Lucent, Cisco, Ericsson, Huawei, Nokia, Samsung, ZTE) on 9 buying criteria. The service providers participating in the study represent about one-third of the world's telecom capex and revenue. To purchase the report, please visit: www.infonetics.com/contact.asp. Download the IHS Infonetics 2015 service brochure (http://www.infonetics.com/downloads/2015-Infonetics-Research-Services-Brochure.pdf) or log in: www.infonetics.com/login. "The 5G debate has started with great fanfare, hype and confusion, but little substance about what it is exactly and what it is not. For now, the mindset is still locked into mobile broadband as we know it with LTE, so it's good that the ITU has just stepped in to define 5G in its brand new IMT-2020," said IHS analyst Stéphane Téral.